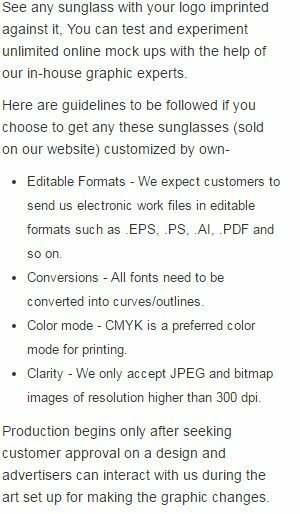 Promotional neon plastic sunglasses custom imprinted offered in 16 colors are sought by advertisers who wish to promote their brand with a difference. These plastic sunglasses are popular with weddings, sororities, fraternities and parties. This sunglass is also favored by fashionistas who wish to create style statements with their appearance. Available Colors: Green with Green, Black with Black, Pink with Pink, White with White, Navy with Navy, Red with Red, Blue with Blue, Black with White, Black with Pink, Black with Neon Yellow, Black with Blue, Black with Green, Black with Orange, Black with Red, Black with Purple, Orange with Orange.